Is there a better sight than a happy, smiling baby? We think not! Typically, babies start smiling between 6 and 12 weeks, but you may notice a smile or smirk soon after baby’s born. These early smiles are called “reflex smiles.” Babies start reflex smiling before birth and continue to do so as newborns. These smiles happen randomly and reflex smiling usually stops around 2 months after birth, right around the same time you can expect baby’s first real smile. A reflex smile is short and occurs randomly, like when baby’s sleeping or going to the bathroom. A real smile happens in response to something external, like hearing mom’s voice or seeing dad. The biggest difference? Baby’s whole face lights up when it’s a real smile. Believe us, you’ll be able to tell! Give them plenty of love and affection. Baby will respond to cuddles, kisses, and a sweet, high-pitched voice. Play with them. Games like peek-a-boo will surprise and delight baby, plus they’re great for brain development. Put on a happy face. Babies imitate the people around them, so start smiling like you’ve never smiled before! Beyond the cuteness explosion you can expect when baby starts smiling around 6 to 12 weeks, it’s also an exciting time for their development. Baby’s vision and facial recognition is improving, and they’re outgrowing their early reflexes. They’re also beginning to express feelings, such as excitement or contentment. Once baby has smiling down, they’ll start cooing (making speech sounds similar to vowels). After cooing comes giggling. Eventually, baby will launch into full on laughing fits. … there’s probably no need to worry. It could just be their temperament or personality. 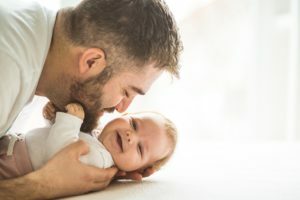 That said, you should let your healthcare provider know any concerns, especially if baby does not communicate with you or other caregivers through sounds and expressions by 3 months or older. 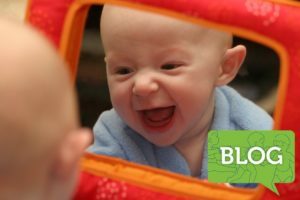 Why are mirrors good for baby? Learn more about how they help development and why babies love mirrors.